Close to both Camp LeJeune and downtown Jacksonville, AA Self Storage’s Jacksonville storage facility is your convenient resource for standard and climate-controlled storage. Our location on LeJeune Boulevard features well-lit parking large enough to accommodate any size vehicle, as well as 24 hour video surveillance and a professional management staff. 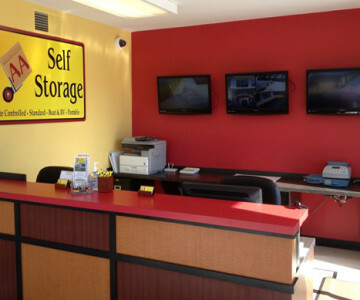 Contact the team at AA Self Storage today to learn more about our Jacksonville storage spaces. Click here for directions to our Jacksonville location. Please do not make reservations at this time through our website. Please call the office at (910) 347-1447. We appreciate your patience.